The Book of Nehemiah is, along with the Book of Ezra, a book of the Hebrew Bible. Told largely in the form of a first-person memoir, it concerns the rebuilding of the walls of Jerusalem by Nehemiah, a Jew who is a high official at the Persian court, and the dedication of the city and its people to God's laws (Torah). The events take place in the second half of the 5th century BC. Listed together with the Book of Ezra as Ezra-Nehemiah, it represents the final chapter in the historical narrative of the Hebrew Bible. The original core of the book, the first-person memoir, may have been combined with the core of the Book of Ezra around 400 BC. Further editing probably continued into the Hellenistic era, but this view is debated. The book tells how Nehemiah, at the court of the king in Susa, is informed that Jerusalem is without walls and resolves to restore them. The king appoints him as governor of Judah and he travels to Jerusalem. There he rebuilds the walls, despite the opposition of Israel's enemies, and reforms the community in conformity with the law of Moses. After 12 years in Jerusalem, he returns to Susa but subsequently revisits Jerusalem. He finds that the Israelites have been backsliding and taking non-Jewish wives, and he stays in Jerusalem to enforce the Law. A list of priests and Levites who returned in the days of Cyrus (the first returnees from Babylon)is presented; Nehemiah, aided by Ezra, oversees the dedication of the walls and the rebuilt city. The book is set in the 5th century BC. Judah is one of several provinces within the larger satrapy (a large administrative unit) within the Achaemenid Empire. The capital of the empire is at Susa. Nehemiah is a cup-bearer to king Artaxerxes I of Persia – an important official position. At his own request Nehemiah is sent to Jerusalem as governor of Yehud, the official Persian name for Judah. Jerusalem had been conquered and destroyed by the Babylonians in 586 BC and Nehemiah finds it still in ruins. His task is to rebuild the walls and to re-populate the city. He faces opposition from three powerful neighbours, the Samaritans, the Ammonites, and the Arabs, as well as the city of Ashdod, but manages to rebuild the walls. He then purifies the Jewish community by enforcing its segregation from its neighbours and enforces the laws of Moses. 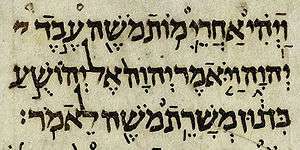 Ezra–Nehemiah, grouped as a single book with the title "Ezra", was translated into Greek around the middle of the 2nd century BC. They were first divided into separate books by the early Christian scholar Origen, in the 3rd century AD, and the separation became entrenched in the 5th century AD when it was followed by Jerome in his Latin translation of the Bible. It was not until the Middle Ages that the separation was introduced into Jewish Bibles. ↑ Dillard, Raymond B.; Longman, Tremper (January 1994). An Introduction to the Old Testament. Grand Rapids, MI: Zondervan. p. 180. ISBN 978-0-310-43250-0. LCCN 2006005249. OCLC 31046001. Retrieved 2012-02-24.